Balt-Transit Ltd, member of Russian Chamber of Commerce and Industry, manufactures and builds log houses and steam rooms (banyas) from cylinder timber. Our company has been established on the Kaliningrad market since 1992. Over the years, a lot of people have become our customers. Among them there are well-known businessmen and politicians. Our company build not only weekand houses , but cottage villages and hotel complexes. Our building material: northern coniferous timber (fir, pine) from the Komi Republic. Our company also uses Siberian larch. Ten years ago we moved to using (so called Finnish) technique – tongue and groove (toothed) profile. Tongue and groove profile provides additional firmness of the log house structure and excludes deformation (‘twisting’) of logs in the log house. The employed technique prevents common drawbacks of a Russian log house and adapts the houses to the humid and windy conditions of the Kaliningrad region. The tongue log profile creates an additional wind and warmth ‘seal’, which is crucial in the Baltic climate. 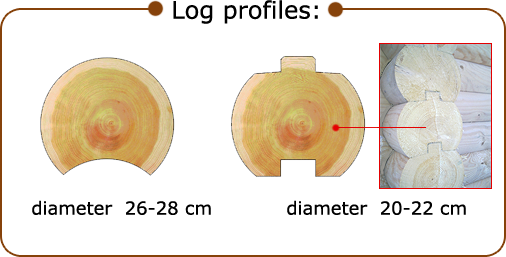 The use of logs with the tongue profile (20-22 cm diameter) allows to maintain the same wind barrier as with the use of the so called Russian profile logs (26-28 diameter). Herewith, the cubic capacity is reduced twice and consequently, the cost of the material delivery to the Kaliningrad region is reduced twofold. Besides, not using heavy logs with the 28-cm diameter makes it possible to build log houses without crane machinery. Therefore, the use of the tongue technique, namely 20-22 cm diameter logs with the tongue and groove profile, allows our customers, without the loss in quality, to gain a profit of 30-50 %, given the equal cost of our product and that of the traditional Russian log houses from 26-28 cm diameter logs. The price of our log houses built according to the new technique is brought down to the price of a Russian log house. Our company offers both typical and individual design plans of cottages, houses, hotels and steam-rooms (banyas). (PROJECTS) We mostly create homes tailored to individual tastes and needs. Computer graphics used at the designing stage allows our customer to see the future house in 3D and, if necessary, to implement corrections before the construction starts. In contrast to some other Kaliningrad log home building companies, we can demonstrate not only computer models but a portfolio of the wide range of the houses we have built. In our office you will be informed about the log house market in the Kaliningrad region. Our employees will provide professional advice regarding structural specifics of wooden cottages, banyas as well as the details of their construction. We will suggest ways to make an appropriate choice of a floor plan and package content of a house or banya. Our environmentally friendly product – profiled logs – arouses more and more interest of potential customers in the Kaliningrad region. We invite you to visit our office, located at 120 Nevskogo St., Kaliningrad, Russia.